January and February herald many things, despair, desolation, cold, misery, darkness, bankruptcy, mumps, typhoid…..no I made some of that up, but generally it takes a bit to get the old fire stoked and get the year motoring up to speed. What it really means to some is Seville Oranges and that then means marmalade. Real, shiny, bitter, sweet, tangy, sumptuous, sticky marmalade. I’ve never been a particular fan until one Christmas, The Flame floated a weighty tomb by Nigel Slater into my grubby mits. Entitled the 4th Kitchen Diaries it charts what grub is in and when throughout the year. February 4th the dashing, young, TV cook slots in some soupy words along with a recipe for ‘Seville Orange Marmalade’. A hip, arty shot enhances the already rampant taste buds. I’m hooked, within days an armful of the Spanish fruits are on the slab being dissecting and boiled. I supply below pics, ingredients and a method (roughly supplanted from Nigel’s sketch). The ingredients are simplicity itself – Seville Oranges 1.3kg (about 15), Lemons 2 off and Golden granulated sugar 2.6kg. You’ll also need 2.5 litres of water. In total this little lot set me back about £7.50, the sugar really costing the most. It tipped up about 10 jars of the golden juice. You will need to put away a few hours of your life. It is time you will never get back so you must enjoy it!! It is worth it though, trust me. 1) First up is to remove the peel and pith from the oranges and lemons. Nigel prescribes a cracking way here. Take a very sharp knife and score four lines down each fruit from top to bottom, as if you were cutting it into quarters. Let the knife cut through the peel without going into the fruit. The peel is then easy to remove by hand. 2) Cut the peel into fine shreds (or to a size you want them if you like a chunkier texture) and put them into a large bowl. This is good training for your knife skills! 3) Squeeze all the juice from the oranges and lemons into the bowl, but catching the pips and keeping them to one side. I found my ‘Joseph Joseph’ hand juicer balanced over a sieve, over the bowl, made this fairly fiddly task go by with minimum fuss. (I’m afraid the kitchen diaries took a bit of a dousing with squeezed orange at this point!). Chop the pulp up and put that in with the juice. 4) Add the 2.5 litres of cold water, pouring it into the bowl with the shredded peel. Tie the reserved orange and lemon pips in a muslin bag and push into the peel and juice. Set aside in a cold place and leave overnight. The pips, the sugar, the boil and rest. 5) The next day, tip the juice and shredded peel into a large stainless steel or enamelled pan (or a preserving pan for those lucky enough to have one) and push the muslin bag down under the juice. Bring to the boil then lower the heat so that the liquid continues to simmer merrily. It is ready when the peel is totally soft and translucent. This can take anything from 40 minutes to a good hour-and-a-half, depending purely on how thick you have cut your peel. (I left mine a good hour and a half to be sure, and the peel was then soft and the pith translucent). 6) Once the fruit is ready, lift out the muslin bag and leave it in a bowl until it is cool enough to handle. 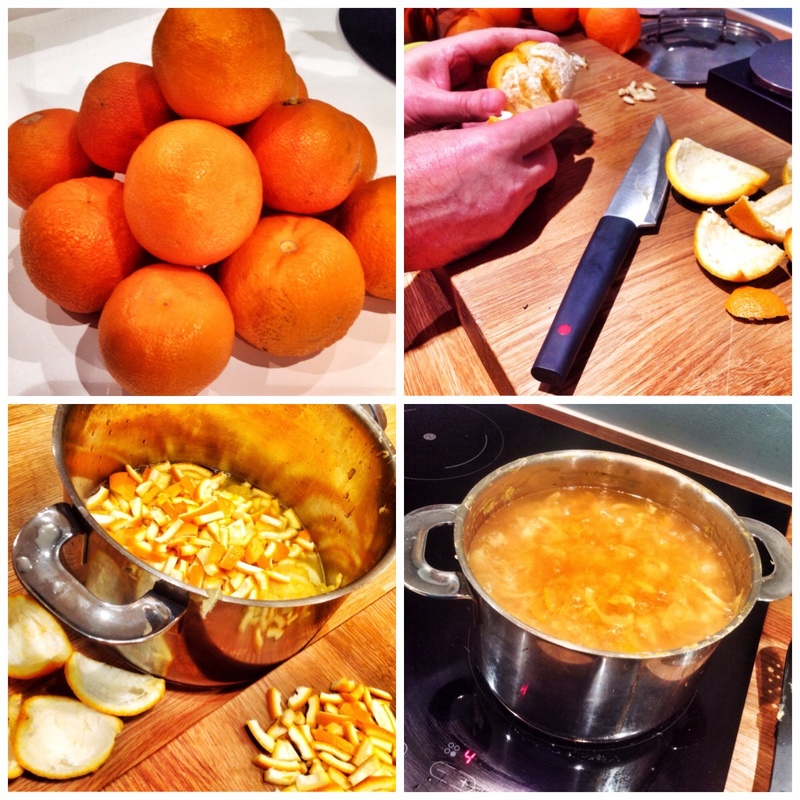 Start adding the sugar to the peel and juice then turn up the heat, bringing the marmalade to a rolling boil. 7) Squeeze every last bit of juice from the reserved muslin bag into the pan. Skim off any froth that rises to the surface. (If you don’t your preserve will be cloudy.) Leave at a fast boil for 15 minutes. Remove a tablespoon of the preserve, put it on a plate, and pop it into the fridge for a few minutes. 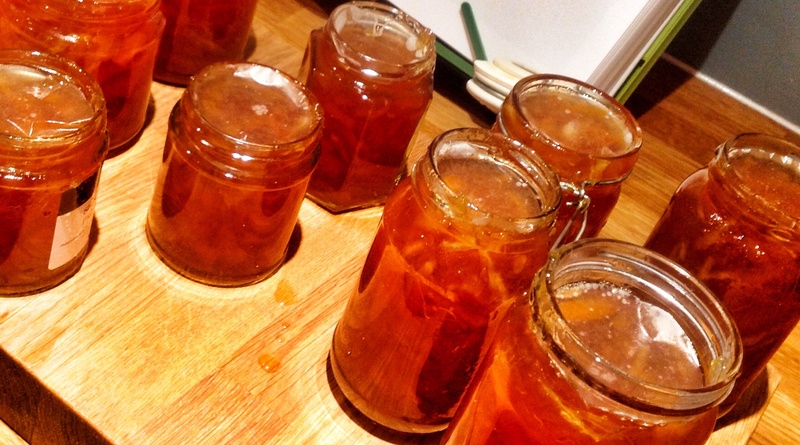 If a thick skin forms on the surface of the refrigerated marmalade, then it is ready and you can switch the pan off. 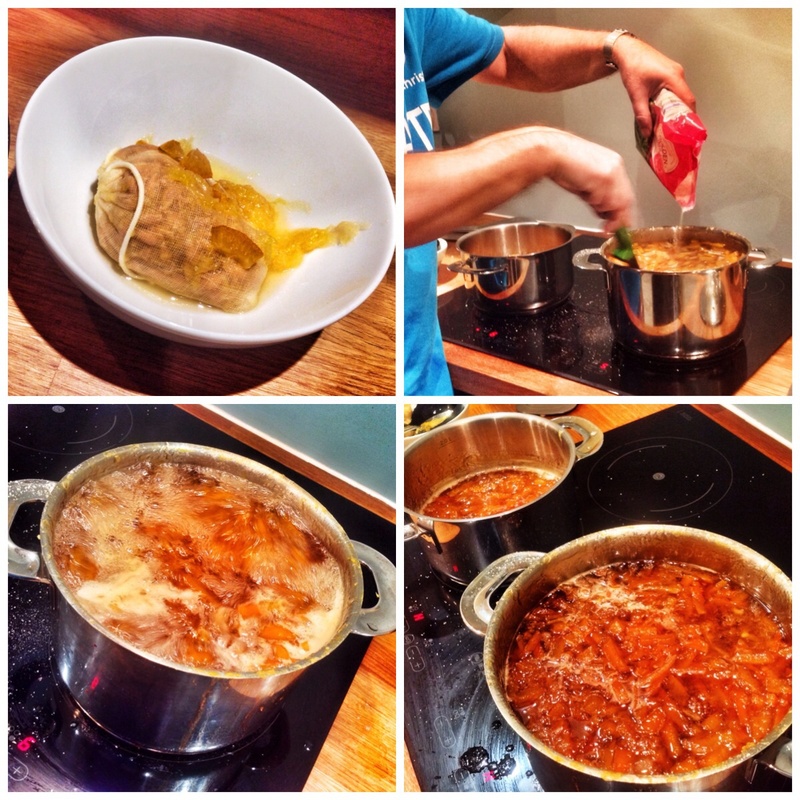 If the tester is still liquid, then let the marmalade boil for longer. Test every 10 to 15 minutes. Some mixtures can take up to 50 minutes to reach setting consistency. 8) Mine did work after 15 minutes. After turning the heat off I got my assortment of jars soaking in water with sterilising tablets. I then ladled the hot, burnt orange juice into the sterilised pots and sealed immediately. Suffice to say I now have a veritable phalanx of sweet, bitter preserve to lash on to the bun, the toast, the crumpet and last but not least the cinnamon bagel. Enjoy. Thanks to Nigel Slater and the 4th Edition of the Kitchen Diaries. Well worth a purchase from all good book shops and inter web portals. Catch Nigel on twitter @NigelSlater where he provides a cordial and helpful repartee in 140 characters! Squeezin’ the muslin bag is simple. Put the hot bag into a shallow pasta drain pan over a proper size bowl. Place an inverted cooking pot lid with the knob removed (and will fit into the drain pan) on the bag, then place another pot filled with water onto the lid. The pressure of the water weight on the lid causing the retained juice to sqoosh out of the bag into the catch bowl. Set the draining bag aside until ready for it. Brilliant tip, wish I’d thought of that today! My last line in the last line “Put the draining bag aside . . . “ refers to getting on with other work necessary for completion of the making. I also left out the final step in sqooshing the bag. After no more dribbles escape the bag and it looks like it’s empty of pectin remnants, I place the bag in a skillet and sqoosh it again by placing another skillet on the bag, raise it over the bowl and squeeze the upper skillet to get the last drops to run out of the edges of the skillets into the bowl. I’ve gotten another 2 ounces of pectin from the dregs. As long as I have your attention. I do a different test for the set. I use a flat wide silicone(?) stirrer dipped into the marmalade, raise it out of the pan and hold it straight up,(with the narrow end down) allowing the droplets to drain off into the pan. I time how long it takes for a ball to form on the edge of the stirrer. Assuming it is not balling after 2 minutes I put the cooking pan back onto the heat for 2 minutes and test it again. The final test is putting the ball of syrup onto my free hand to see if it stays firm. Done! Heads up, boys and girls. The final solution to getting all the pectin out of the muslin bag containing the pips. 1. Instead of using a bag, use a 16″ X 16″ piece of muslin – putting the pips in the center and tying it up into a bag. Upon removal of the muslin bag from the cooking pot – do the squishing as discussed in my previous advice. When the bag is cool enough cut the string and remove the pips to a plate. 2. Now you have the pectin laden muslin (16″ X16″) piece. Fold it once lengthwise so you have a 8″ X 16″ piece. Using a bench scraper, or other straight edged instrument and a flat dinner tray or cookie sheet, run the scraper down the long length of the muslin and thereby collect the pectin from the muslin cloth which you gather from the flat surface and deposit into the cooking pot. Do the scraping again on the reverse side of the cloth. After finishing the scrape action, bring the muslin together and twist it the get those final drops of pectin into the pot of marmalade. 3. Untwist the muslin and put it into a bowl with a cup of water and let the remaining pectin wash out, add the water to the cooking pot and go on to the set. The water will evaporate during the final boil and the pectin remains to the set.